Complete Name: Intellitec Controllers Brief Information: Slideout Control Module 300 Complete Overview: Intellitec's Slide-Out Controllers are a part of the expanding family of the MONOPLEX™ System. 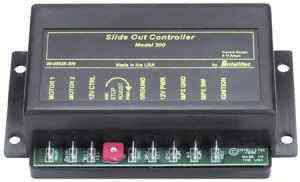 These controllers are designed to control the operation of a slide-out room electrical mechanism. The controller automatically stops the slide-out when it reaches it's inner or outer limit by sensing the current drawn by the motor. This eliminiates the need for the owner to hold the switch in the ""ON"" position for the entire extend/retract cycle, or installation of the limit switches and associated wiring during installation. Operating Environment Protected from direct weather.